It is the home of Maven Black-Briar, her son Hemming Black-Briar, and her grand-daughter Ingun Black-Briar. Maven's housecarl, Maul, resides here as well. Ingun spends most of her day in Elgrim's Elixirs, and returns at night to sleep. This is an easy target for thieves as it is likely to be unoccupied most of the day. 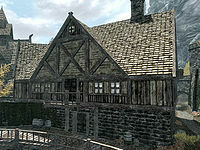 Entering the manor brings you into an oddly shaped reception room with a chair to your left, a long end table against the northeast wall, with a note regarding the loss of a shipment of Black-Briar Mead to Cyrodil on top and a doorway to the right of it. Against the southeast wall is a tall wardrobe and another long end table that holds an iron sword, with a doorway to the right of it. In the western corner is a small sitting area with two chairs and a low table between them. On the table is a bottle of Black-Briar Mead. To the southwest of the door way is a cupboard against the southwest wall holding plates and a bowl. There is a alcove containing several crates, sacks and a couple of Black-Briar Mead barrels. Climbing the stairs to the second floor leads to a large landing, again oddly shaped. In the northeastern corner is a set of shelves holding a bunch of tundra cotton and copies of Lost Legends and Ruins of Kemel-Ze, with wooden benches to the left and right, against the walls. To the south is another storage area with crates, sacks and a Black-Briar Mead barrel. To the west is a door that opens into Maven's large bedroom with a king-sized bed coming out from the southeast wall, with a long unlocked chest at the foot of the bed, an end table with a goblet and bottle of alto wine on top and wardrobe containing fine clothes to the left and a long end table holding a letter from Christophe and a letter from Sabjorn and a couple of chairs to the right, with a small table holding a bottle of wine between them. Opposite the chairs is a fireplace with a piece of firewood to the left. Against the northwest wall is a wardrobe containing clothes with a door out onto a small balcony that looks out over the canal and marketplace to the right. Another wardrobe stands in a corner to the north. Opposite the internal door is a set of shelves holding a statue of Dibella, a purple mountain flower, a bunch of tundra cotton and copies of Alduin is Real and The Arcturian Heresy and a final wardrobe is to the right of these.